The country gospel quartet the “Country Gospellaires” made their Songs of Hope radio debut on 2 June on Southern FM 88.3. 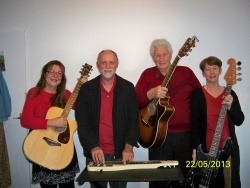 The members are, from left, Adela, John, Adrian and Val. In our podcast today they sing “I saw the light”.